Defence solicitor Gareth Noble has said the boy is trying to rebuild his relationship with his mother. A TROUBLED YOUTH who repeatedly kicked his mother in the head, leaving after he demanded money and new clothes, has been spared a custodial sentence. 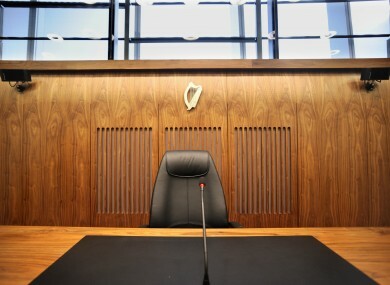 The teen subjected his mother to a series of serious domestic violence incidents, the Dublin Children’s Court heard. Judge John O’Connor was furnished with an updated pre-sentence probation report on the teenager yesterday. Finalising the case, he imposed a six-month probation bond on the youth. This compels him to be of good behaviour and co-operate with the Probation Service to address his offending otherwise the case could be re-entered and he would face the possibility of a term in custody. The boy, then aged 17, had pleaded guilty earlier to assault causing harm to his mother on a date in September and two less serious assaults on her at their home during which she had to fight him off her. He is attending a psychiatric service and drug abuse counselling, his solicitor Gareth Noble said. Previously the teen had been in a chaotic situation and had to live with other family members, Noble said. At an earlier stage, Judge O’Connor had cited UN figures on domestic violence and said that in this case the violence was from the child. He had told the youth, now aged 18, that “what you did was horrific” and to avoid a custodial sentence he would have to face up to what he did in his meetings with his probation officer. The judge has also said that given the nature of the case the mother should be praised for her bravery and the continued support she has given her troubled son. Garda Keith Brannigan said that during the attack in September there was an altercation between the youth and his mother after she refused to give him money. “He ran over and spat in her hair and kicked her in her ear,” he said. The court heard the woman crouched and he then kicked her in the face and legs and four times to the head. He then ran after her but stopped and left when a taxi arrived to pick him up, the court heard. Garda Brannigan showed the judge photos of her injuries and said the woman “feared for her life and feared if he continued to kick her in the head she might not survive”. On another date there was incident after the boy requested new clothes. The teen shouted in her face and spat in her hair and as she tried to get up, he kicked her right left and her lower back. The last incident happened in October when the teenager demanded money for new clothes but she told him she did not have any and he would have to wait until the following day. The youth knocked her onto the ground and kicked her in the head. “She tried to get him off her and scratched him to get him off her,” the court was told. The teenager then left leaving her in fear, the garda said. Defence solicitor Gareth Noble has said the boy is trying to rebuild his relationship with his mother. The court has heard evidence from a youth advocate that the teenager is attending drug counselling and family therapy. He also got a job with the prospect of learning a trade and had suffered from stress and anxiety for a number of years and felt quite frustrated that services did not listen to him and he “was trying to manage things himself with drug use”. The judge has said he was of the belief the teenager had mental health problems which were exacerbated by drug use. He said a quarter of the defendants before the Children’s Court had mental health issues. At an earlier stage in the case, the defence solicitor stressed that in trying to get help, the youth had “fallen between two stools” while efforts were made to determine if his issues were connected to mental health difficulties or substance misuse. There had also been serious self-harm incidents and the teenager had ended up in emergency hostel accommodation until he was taken in by a relative. The court was told that on another date €235 worth of cocaine, bagging equipment, a weighing scales and a suspected mixing agent were found at his home. The court was told that he had not been taking his medication but instead was on illegal drugs. Email “Youth who kicked his mother in the head during assaults spared jail”. Feedback on “Youth who kicked his mother in the head during assaults spared jail”.